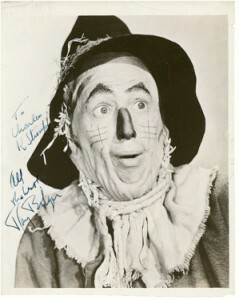 Vintage glossy 7.5 x 9.25 photo of Bolger as the Scarecrow, signed and inscribed in fountain pen “To Charles K. Stumpf, All the best, Ray Bolger.” Three binder dings to right edge, paperclip impression along top edge, and some scattered surface marks and creases, otherwise fine condition. Ray Bolger was born and grew up in Dorchester, Massachusetts, a middle-class neighborhood. His father was a house-painter, his mother a homemaker. He was inspired by the vaudeville shows he attended when he was young to become an entertainer himself. He began his career as a dancer. His limber body and ability to ad lib movement won him many starring roles on Broadway in the 1930s.